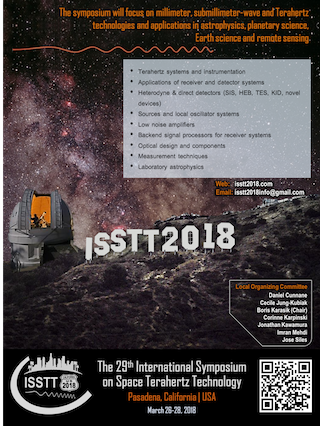 It is our honor to announce that the I. Physikalisches Institut of the Universität zu Köln (University of Cologne) will be hosting the 28th International Symposium on Space Terahertz Technology (ISSTT 2017). 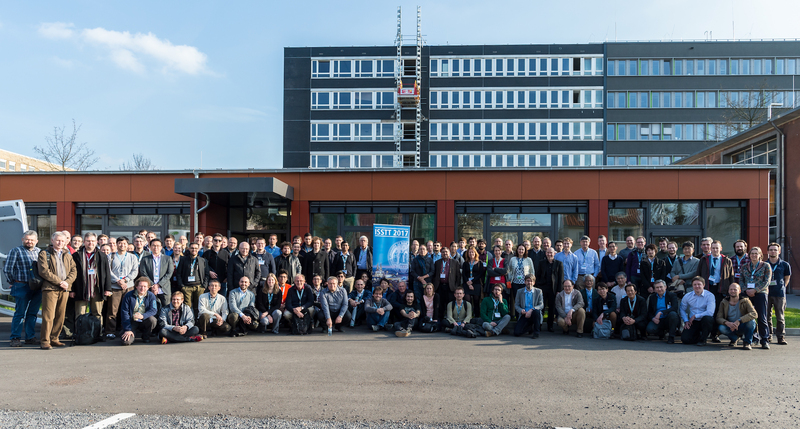 The conference will take place from March 13th to 15th with a Welcome Reception on March 12th and an optional tour (with limited seats) to the Effelsberg radiotelescope on March 16th. Cologne (spelled "Köln" in German, note the Umlaut, and pronounced [kɔ.lɔɲ]) is a friendly city full of culture and open to foreigners. Getting around talking english should be easy also because it is home to one of the biggest universities in Germany. Cultural center piece is the gothic cathedral "Kölner Dom", one of the largest in the world, and took nearly 800 yrs. to build. It also serves as an easily and from far away recognisable landmark (by law no building is allowed to be nearly as tall) and actually will guide you when walking the town. Cologne's layout is medieval meaning the major roads are laid out on an concentric pattern with radial roads all pointing to the cathedral. Due to this effective pattern it is encouraged to walk the town and not use public transportation. Cologne's cultural heritage dates far back to when the Romans occupied the area some 2000 yrs. ago. Subsequently its modern name is derived from the original name "Colonia Claudia Ara Agrippinensium". Beneath the inner city you will find the remains of old roman houses and there are several museums that display Roman and Germanic exhibits and excavations, look here for more details. Due to its location central in Europe and laying at one of the most important natural transportation routes, the river Rhine, Cologne throughout the Middle Ages and Renaissance was a prosperous city thanks to trade. And, yes, the term Eau de Cologne indeed originates from the city. Cologne features several fine art museums, most importantly the Museum Ludwig and the Wallraf-Richartz-Museum, with rich collections of paintings from late medieval times, from e.g. Stephan Lochner, Flamish and Italian Renaissance to (neo)classicism to the modern (Picasso, Beuys, Warhol and - far - beyond). You should plan a few extra days in case you have never been to Cologne before. At the end of WW2 70% of all homes in Cologne were destroyed including most of the downtown area next to cathedral. As you will see much has been rebuilt but scars from the too quick rebuilding of the city in the 1950s still remain and are an every-day silent reminder of what got irrevocably destroyed. A Welcome Reception will be held on Sunday March 12 from 18:00 to 21:00. The symposium banquet including a reception will be held Tuesday March 14 starting 19:00. Both the welcome reception and the banquet as social highlights of the conference will take place at the "Wolkenburg", which is a nice location in walking distance (or three tram stops with tram line No. 9) from the University. 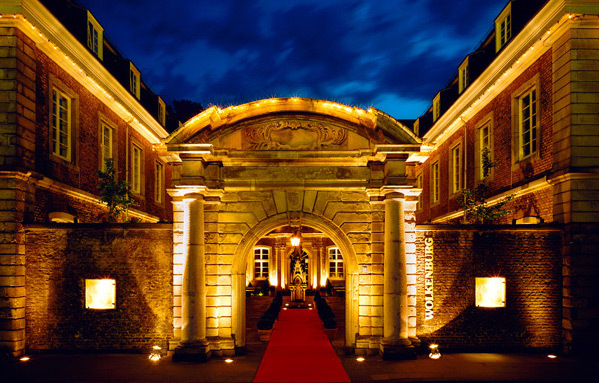 The "Wolkenburg" was built in 1734 and features a baroque interior. Directions: A Google map can be found here. The closest stop for tram line No. 9 is "Mauritiuskirche". The venue lies directly opposite of the church St. Mauritius in the bend. Walking times are approx. 5 min to Cologne's central square and tram/subway hub "Neumarkt", 10 min from "Rudolfplatz" and approx. 15 min to the University area. Within approx. 15 min walking distance you will find several hotel options (see below for more). 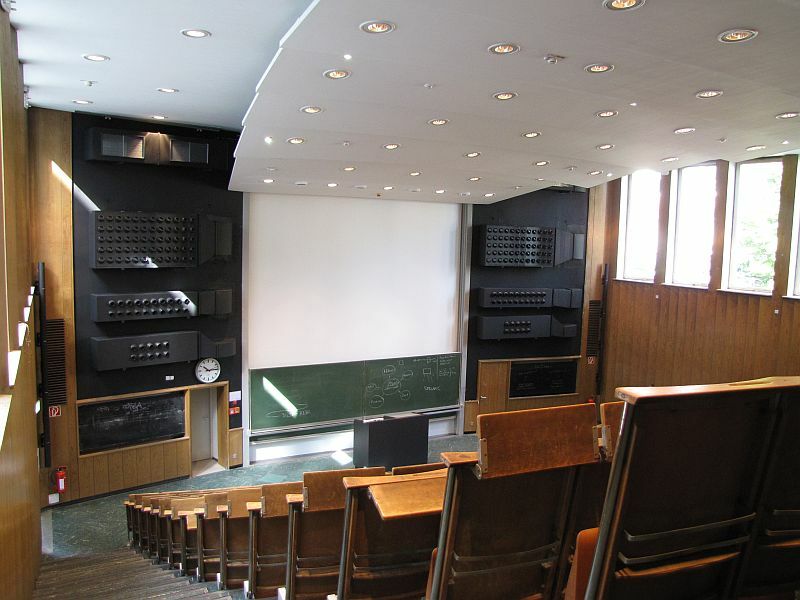 The symposium will be held at the lecture hall "Großer Hörsaal Botanik" and neighboring seminar rooms, which is approx. 15 min by foot from the Physics department. The street address is Gyrhofstraße 15 in 50931 Köln. A scaleable map of the University of Cologne campus with marker for the lecture hall is here. Directions: The lecture hall is easy to reach by public transportation or by foot from several hotels suggested below. It lies between the main University buildings and the University Hospital. Use the tram line Nr. 9 and tram stop "Weyertal", which coming from the town center is one stop further than "Universität" and where the Physics Institutes are situated. Walk down the street "Weyertal" in northern direction for 500 m (link to Google). 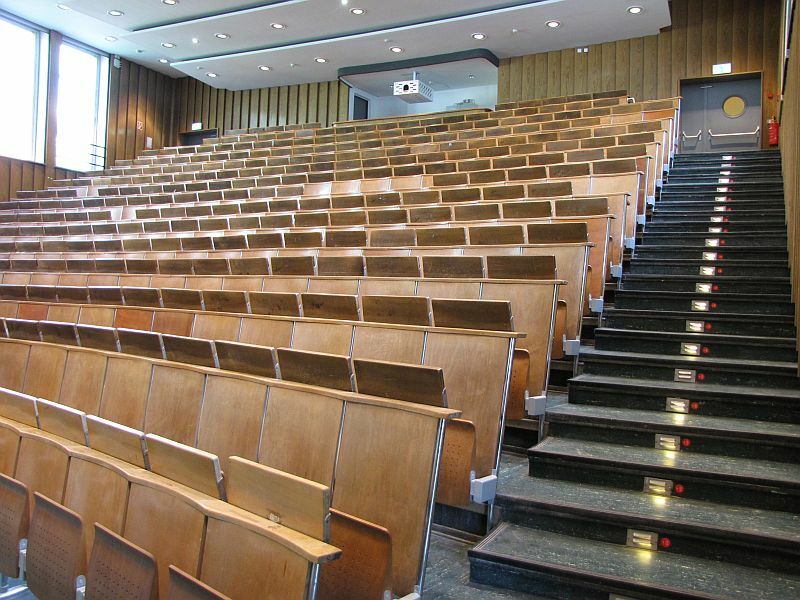 The lecture hall is a two story reddish brown building with a flat roof to your left at the intersection of the streets Weyertal to Gyrhofstrasse. Please do not get discouraged by the "somewhat low esthetics" of the buildings facade... ;-). A zoomable Google map of the university area centered on the symposium location is provided below. If you have any questions or problems concerning abstract submission, please contact us at isstt2017info (at) ph1.uni-koeln.de. Please use this template in MS Word™ .doc format for the max 500 word half-page abstracts and indicate your preference of presentation and topic. For people not using MS Word™ or Open Office you can download a .pdf file as guide for the layout. to access the external page of our congress management service partner. Abstracts in .doc, .docx and .pdf format are accepted. Please note that an abstract ID will be given that is asked for during the registration process (see comment below). Use this link to replace an existing abstract using your abstract ID. Throughout cost calculation we were committed to keep the registration fees for the symposium similar to previous years. The fees are as given in the table below. to access the secured external page of our congress management service partner. Registration includes the conference material (abstract book and goodies), all coffee breaks, the Welcome Reception (drinks and buffet) on Sunday evening March 12 and the banquet incl. a buffet reception on Tuesday March 14 for one attendee. 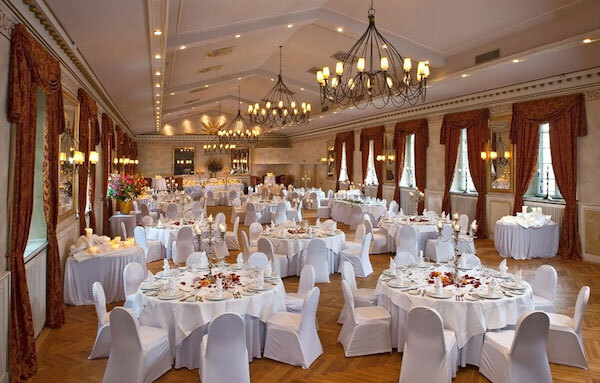 In addition, accompanying persons can be registered for the banquet at a cost of 100 EUR per person. Please note that it is our goal to to allow only one presentation (oral or poster) per registered attendee. In order to aid coordination an abstract ID will be asked in case you are a presenter. We had a few enquires concerning the separate payment of fees for accompanying persons and registration options that might not comply to individual funding rules. In this case we suggest on-site payment. We will be only able to handle cash, though. If you plan to do so please list the items in the comments field during the registration process. This enables us to keep track of what will be needed during execution of the symposium. If you have any questions or problems concerning registration, please contact us at isstt2017info (at) ph1.uni-koeln.de. We are happy to announce the program. You can access the symposium's schedule via the button below. From there you can navigate to each individual session. The downloadable pdf version of the abstract book is available below. The file size is 27 MB. We will continuously update the online pdf version to reflect any updates. "SOFIA, the First Three Years of Full Operation"
"Engineering the physics of superconducting hot-electron bolometer mixers"
"Application of Terahertz Technologies in Laboratory Astrophysics"
Regular oral presentations are 15 min plus 5 min Q&A. The invited talks are 25 min plus 5 min Q&A. We will provide a presentation laptop running Win7 OS with MS Powerpoint, Acrobat Reader and Open Office Impress and a remote with laser pointer. An Apple laptop can be provided for Keynote if asked for in advance. For smoother operations and scheduling it is favored to use the presentation laptop. Please have your presentations loaded into the laptop before the presentation is scheduled either before the first session or during the breaks. Do not use "special" fonts as these might not work on the presentation laptop and try to refrain from using embedded multimedia (movies etc.). For later please contact the LOC in advance so that we can try to provide the correct codec on the presentation laptop. A short test run of multimedia files before the session is in any highly recommended. In case you want to use your own laptop we will provide VGA and HDMI (tbc.!) connections. Our poster walls have a free area of 1.60m height x 1.20m width, e.g. nicely framing a DIN A0 area in portrait mode. In order to be on the safe side reduce 10 cm on either side. Please check the poster session detail section for the assigned poster number. Pins for the posters will be provided. The poster session officially starts Monday March 13th at 4pm right after the coffee break. The poster can be kept up until Wednesday March 15th until noon for further discussions and then need to be removed. The proceedings of the ISSTT 2017 have been uploaded to the online library at the NRAO. Peer-reviewed papers have been published in a special issue of the IEEE Transactions on Terahertz Science and Technology (TST). The SOC wants to come to a complete proceedings of the ISSTT2017 for the online library at the NRAO. This library is a centerpiece to the symposia series and adds substantially to the ISSTT's profile. Simultaneously, publication of fully peer-reviewed papers in a special issue of the IEEE Transactions on Terahertz Science and Technology (TST) is important to further strengthen the reputation of the ISSTT in- and outside of the community, and additionally is a good opportunity for authors to publish a peer reviewed paper. Therefore for the proceedings of the ISSTT 2017 the SOC decided on a two-fold procedure. Each author that submits a paper has the choices described below, which are also summarized in the graph. Submission of a full paper using the standard IEEE peer-review procedure and rules for publication in a special ISSTT section of the November 2017 issue of the IEEE Transactions on Terahertz Science (TST) and Technology. Use this website for submission selecting "Special Issue Paper" at Step 1 and a reference to the ISSTT2017 in the cover letter to the editor. 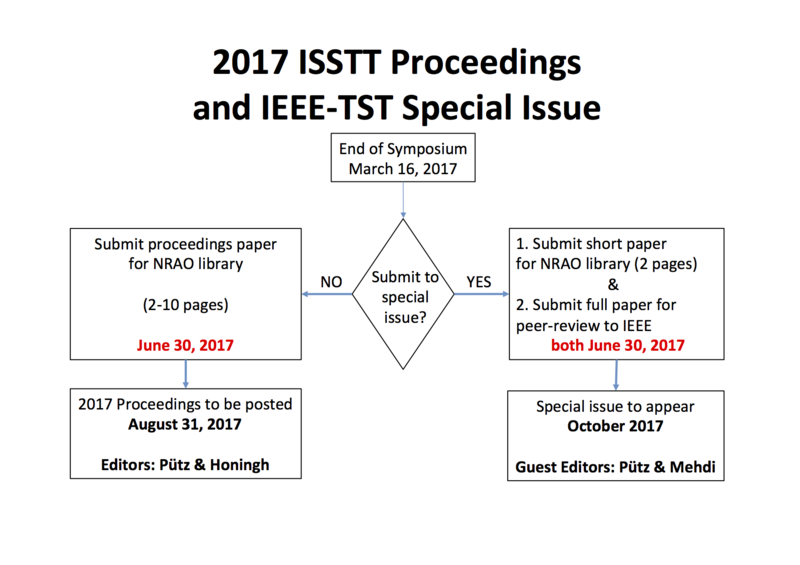 The targeted publication date is earlier than previous years and it is hoped that this makes submission to the IEEE TST even more attractive. The timeline from deadline to publication date is demanding but is considered worth the extra effort on the reviewer and editorial side. Please note the 8 page limit at no charges incurred, beyond that 200 USD/page are asked for. Use these IEEE templates for your paper. The article is comprehensible and meets acceptable standards of English. The article meets a minimum criterion for technical substance established for the periodical, in this case: New and original articles describing significant work and/or ideas not found elsewhere in the literature. The transactions does not accept incremental submissions. All related previous work by the authors must be referenced, even if it was presented in conference. Theory, measurements, and simulations should be supported by careful comparisons. In parallel, and this is a modification to previous years, we explicitly ask for a supplementary 2-page short paper version for the NRAO ISSTT proceedings library using this MS Word™ short-paper template (updated May 30). This template includes a reference to the submitted IEEE TST full paper and needs to comply to the aforementioned IEEE publication guidelines. In case you only plan to submit a paper to the NRAO proceedings library please use this MS Word™ long-paper template (updated May 30). All submissions for the NRAO proceedings library will be handled by the ISSTT2017LOC, use the email address given below. Please use the applicable MS Word™ template from above. There will not be a paper print of the proceedings. The scientific organizing committee will meet for during the lunch break on Monday. For this year we have decided to invite all the reviewers, the traditional SOC members and a few more in order to have a more complete representation of the research groups worldwide. Legend: xReviewer, +not attending symposium. The city of Cologne (spelled "Köln" in German, note the Umlaut, and pronounced [kɔ.lɔɲ]) is situated in one of the busiest areas in the far west of Germany at the River Rhine and profits from a very dense public transport system that interconnects all the towns in the area. Arrival will be either at Cologne/Bonn airport ("Köln/Bonn" IATA code CGN) with direct access to the cities local commuting trains or at the Cologne main train station "Köln Hauptbahnhof" ("Köln Hbf"), which is situated directly in the city center und has direct subway access. From outside the EU, generally speaking, most will arrive at Frankfurt/Main airport (IATA code FRA). Note the "/Main" extension, there is also a town called "Frankfurt/Oder", which is somewhere completely different (...). Frankfurt/Main is the biggest airport hub in Germany and lies approx 200 km from Cologne. From there you can either transfer to a connecting flight to Cologne/Bonn airport or, more commonly, use the train from FRA to the Cologne Main train station (see below). Within the EU you probably will arrive via Frankfurt airport or maybe have some easier connections via the Cologne or the Düsseldorf airport (IATA code DUS), approx. 50 km away with subsequent transfer by train. People from France and the Benelux might also want to consider the excellent Thalys high speed train that connects Paris Gare du Nord via Bruxelles to Cologne. Using the train from Frankfurt/Main airport you have two options. First is travelling on a combined flight and train ticket as offered by Lufthansa and Star Alliance members (note the peculiarities explained below), and second is getting an individual train ticket at Frankfurt/Main's long distance train station "Fernbahnhof". Please be aware that the Frankfurt/Main airport has two train stations, one for local commuting and the other for the long distance connections called "Fernbahnhof". You will need the latter to get to Cologne. Using the high speed train Intercity Express "ICE" of the Deutsche Bahn "DB" the ride will be less than 1 hour and cost roughly 100 EUR per trip. Your destination will be "Köln Hbf" ("Köln Hauptbahnhof") Cologne's main train station. It is recommended to use the fastest ICE train that departs approx. every hour. You can check the Deutsche Bahn schedule here (select departure from the dropdown "Frankfurt(M) Flughafen Fernbf" and destination "Köln Hbf" by typing "Koeln"). With Lufthansa or Star Alliance member carriers besides a direct connecting flight to Cologne/Bonn airport (IATA code CGN) you can also book a combined flight/train ticket to Cologne Main train station Köln HBf, which for this purpose has its own IATA code QKL. Note that in case you have such a combined air/rail ticket your destination on the plane ticket and luggage tag should read "QKL". In this case your luggage will not be handled by the standard luggage conveyor belt of your flight but rather at the dedicated "AIRail" desk, which ist outside of the airport security and above the platforms of the Fernbahnhof. Simply following the red and white "DB" logo of the Deutsche Bahn and "Fernbahnhof" signs at arrival and through customs you should inevitably pass the AIRail counter to pick up your suitcase. Good luck. From Cologne/Bonn airport "Flughafen Köln/Bonn" you will need to either choose public transport from the underground station at the airport or take a taxi outside of the terminal. The underground train station is shared between long distance trains (RE or RB in direction "Köln Hbf") and local fast commuting trains "S-Bahn" (lines S13 and S19 in direction "Düren") both leaving from platforms 1 and 2. A timetable can be found here (choose "Köln/Bonn Flughafen" from the dropdown and "Köln Hbf" by typing "Koeln" in the appropriate fields). There are two sets of ticket vending machines, see this page for the airport services. Luckily all methods of public transportation share the same tariff system "VRS" for which you can get a ticket on either machine. As long as you choose the sufficient tariff zone you will be fine and can swap between transport options until you reach your destination. Note that round trips are not allowed. You will need a ticket, which costs you EUR 2.80, either by selecting the VRS tariff "1B" from a VRS machine or by selecting a destination (e.g. "Köln Hauptbahnhof" works) from a DB machine. There are no ticket vending machines in the DB or "S-Bahn" trains - you will need to get a ticket from the machines situated above the platforms! With this ticket you can get to any destination within the city including all hotels and both the Wolkenburg and symposium venues. Inside Cologne the local public transport for trams and subway is run by the Kölner Verkehrsbetriebe "KVB", also member of the VRS tariff system. As the public transport is an open system with no barriers expect to be controlled by plainclothes ticket inspectors inside the trams. Use this KVB public transport online search engine or one of these apps. This page provides a general overview of the tariff system for the town and surroundings. For Cologne incl. airport you will need a ticket "1B", EUR 2.80. Same is true from the main train station Köln Hbf you will need a "1B" ticket to get to the university or Wolkenburg venue. There is also a short haul ticket (max. 4 stops by tram/subway), Kurzstrecke "K" for EUR 1.90, which might be suitable for transfer from your hotel to either venue. It should be pointed out that from various hotels a walking distance will be less than 30 min. Further tourist information can be found on the official tourism page of the town. Important: If you require a visa to enter Germany and need to confirm acceptance of your submission before arranging travel (check your VISA processing times), please submit your abstract as soon as possible and contact the LOC at isstt2017info (at) ph1.uni-koeln.de for a letter of invitation. For other questions or problems concerning your travel plans, please contact us and we will try to assist you. We are looking forward to meet you at the ISSTT2017. Cologne is a city with many tourists and also features the largest commercial fairs in Germany. During planing of the symposia dates the LOC took care to avoid the largest fairs. There are several hotels in walking distance to the symposium venue. We have therefore decided not to set up any contingent for hotel rooms. In any case it is advised to book a room well in advance. We offer the following as guide and assistance for you accommodation search. For a general overview of location here is a Google map of hotels in the vicinity of the University of Cologne. Use this list of hotels that offer a rebate for University of Cologne guests. The hotels in the list are categorized according to their rating and distance from the university main building (last column). Either use the "Buchungscode" (booking code) given in column 1 at the hotel webpage or use the direct contact email in column 9 referencing being guest of the "Universitaet zu Koeln". Please note that the prices are not guaranteed and the rebates are suspended during commercial fairs. In addition, you can get a leave on the 5% tourist tax if you download and fill out this form and pass it on with hotel booking of aforementioned hotels. Hotels from above list that are in a reasonable walking distance to the venues are recommended in the following. All hotels offer free wifi. The additional rating is according to Google. Alternatively you can check the usual online platforms. We set up following links to aid your search: LINK 1 or LINK 2. It is advised to compare prices between both the online platforms and the University list. If you have any questions or problems concerning finding a suitable accommodation, please contact us at isstt2017info (at) ph1.uni-koeln.de and we will try to help. Raith GmbH is a leading precision technology solution provider for nanofabrication, electron beam lithography, focused ion beam fabrication, nanoengineering and reverse engineering applications. Radiometer Physics GmbH is one of the leading suppliers for remote sensing, millimeter wave, sub-mm and THz instrumentation and components.